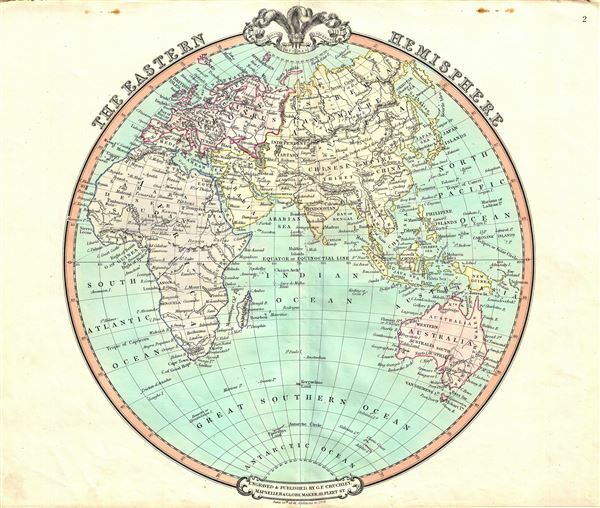 A fascinating 1852 map of the Eastern Hemisphere issued by George Frederick Cruchley. It offers a fascinating snapshot of the world during a period of rapid globalization and discovery, and includes entirety of Asia, Europe and Africa as well as Australia and much of the Pacific. The map is color coded according to continents with countries, major cities, rivers, mountains and other topographical features noted. Relief is shown by hachures. Vast stretches of unmapped territory and speculative cartography fill central Africa and Australia. Antarctica is only tenuously denoted, reflecting the primitive state of exploration in the region. In Africa, Lake Moravi (Lake Malawi) is shown speculatively. Neither Mt. Kenya nor Mt. Kilimanjaro are present though the apocryphal Mountains of the Moon stretch across the continent. The White Nile is shown originating from the Donga Mountains. In China, the Great Wall is identified. The sea between Japan and Korea, whose name, either the 'Sea of Korea' or the 'Sea of Japan,' is currently a matter of historical and political dispute between the two countries, is here identified in favor of Japan. Very good. Minor wear along original centerfold. Minor rust marks in top margin, not extending onto printed area. Blank on verso.